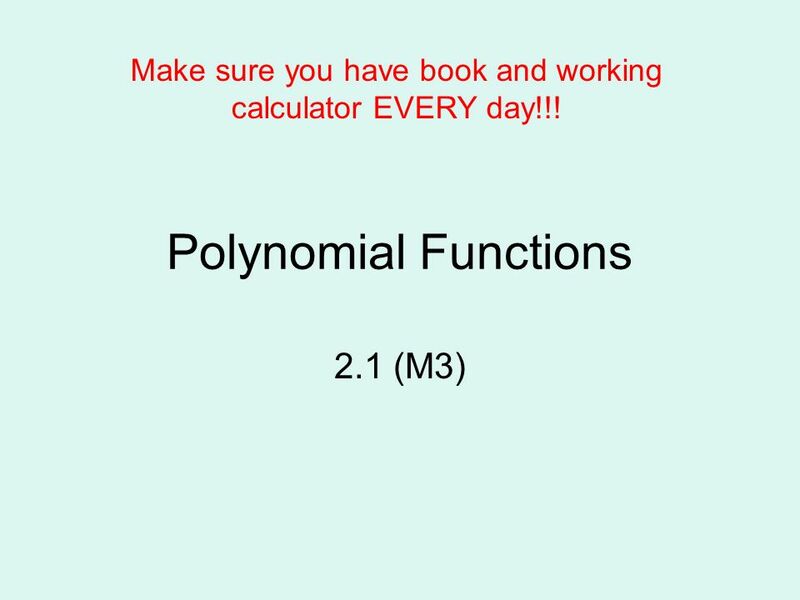 1 Make sure you have book and working calculator EVERY day!!! 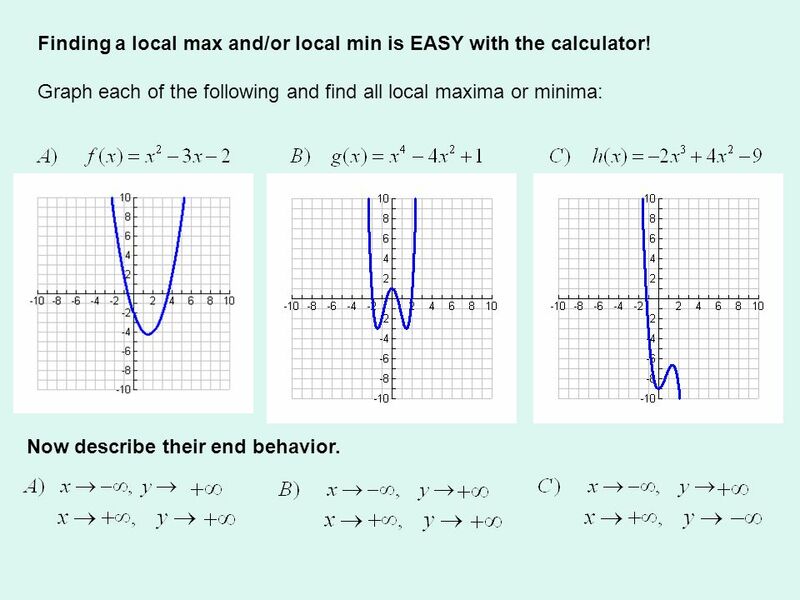 11 Finding a local max and/or local min is EASY with the calculator! 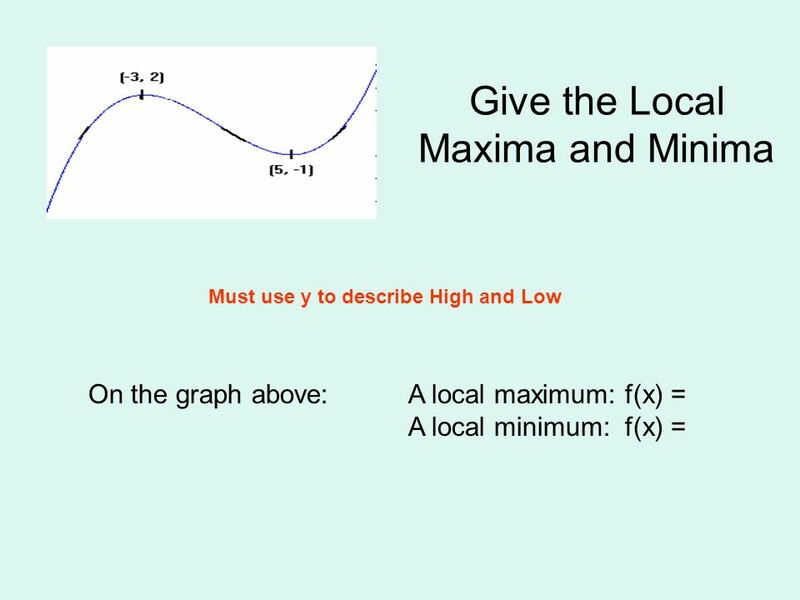 Graph each of the following and find all local maxima or minima: Now describe their end behavior. Download ppt "Make sure you have book and working calculator EVERY day!!!" 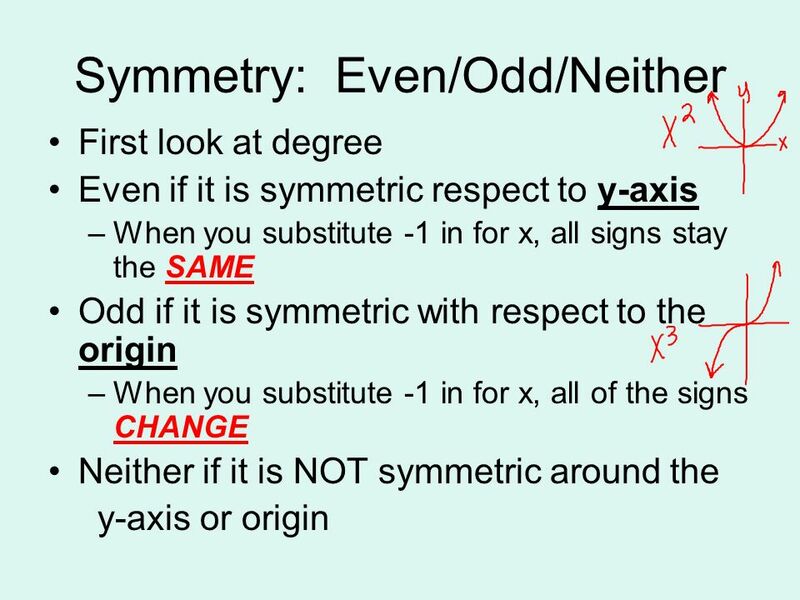 Vocabulary axis of symmetry standard form minimum value maximum value. 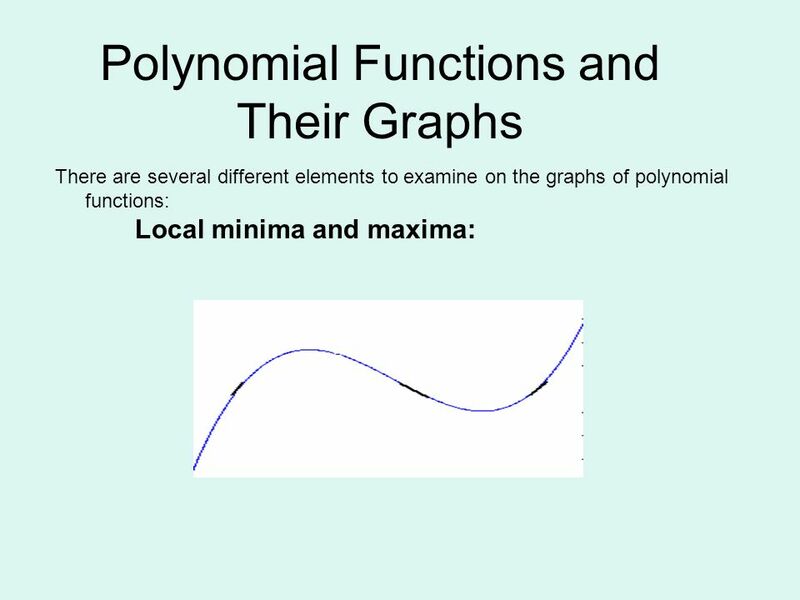 SECTION 1.7 Graphs of Functions. T HE F UNDAMENTAL G RAPHING P RINCIPLE FOR F UNCTIONS The graph of a function f is the set of points which satisfy the. 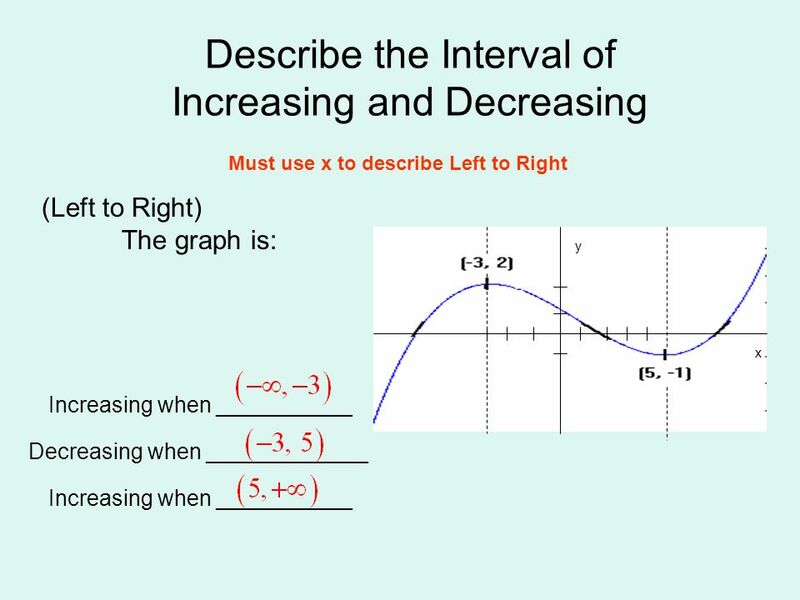 Each part of graph is described as: 1)Increasing : function values increase from left to right 2)Decreasing: function values decrease 3)Constant function. Lesson 3.1 Graph Cubic Functions Goal Graph and analyze cubic functions. “ARE YOU READY FOR THIS?”. 1. 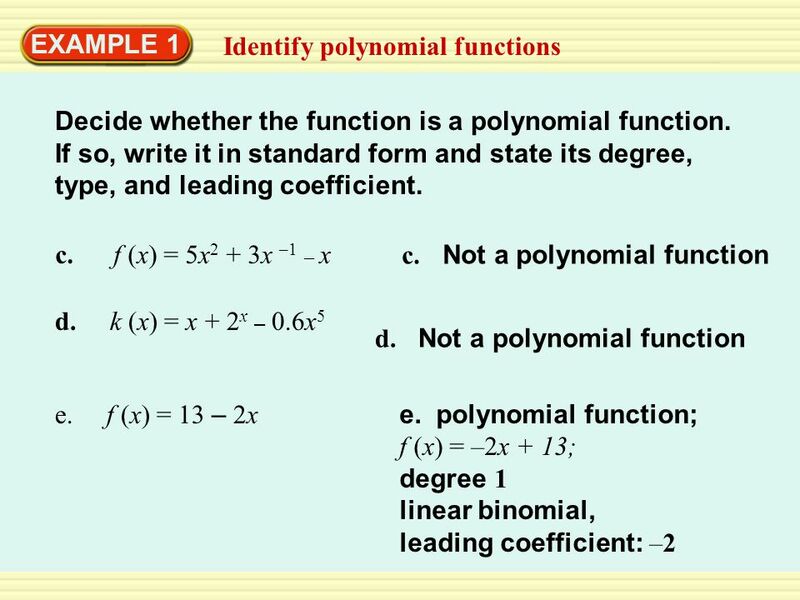 Classify this polynomial by degree: f(x) = 4x³ + 2x² - 3x + 7 a. binomial b. 4 term c. cubic d. quartic How do you know? Properties of Functions Section 1.6. 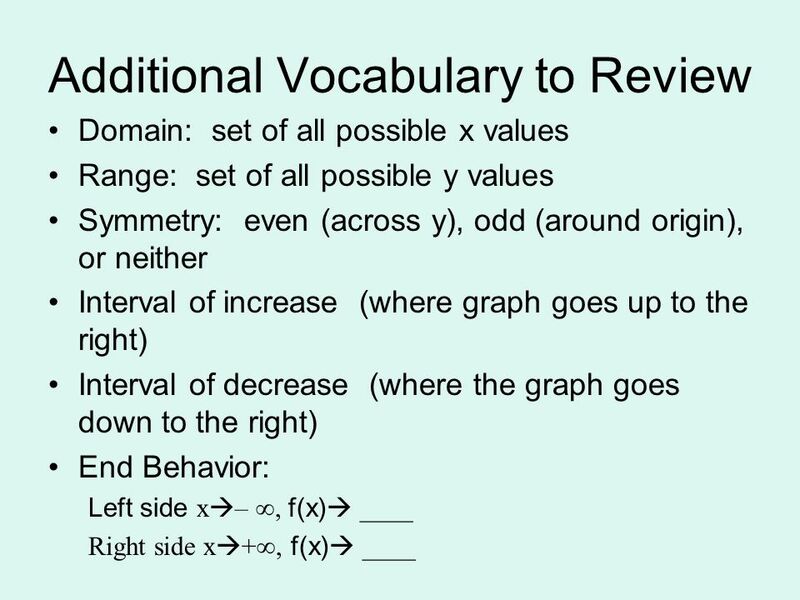 Even functions f(-x) = f(x) Graph is symmetric with respect to the y-axis. 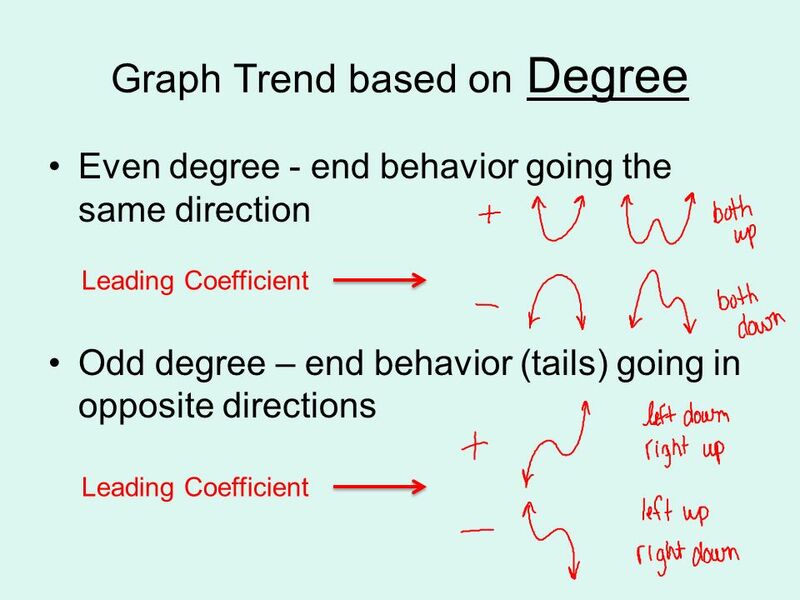 More on Functions and Their Graphs Section 1.3. 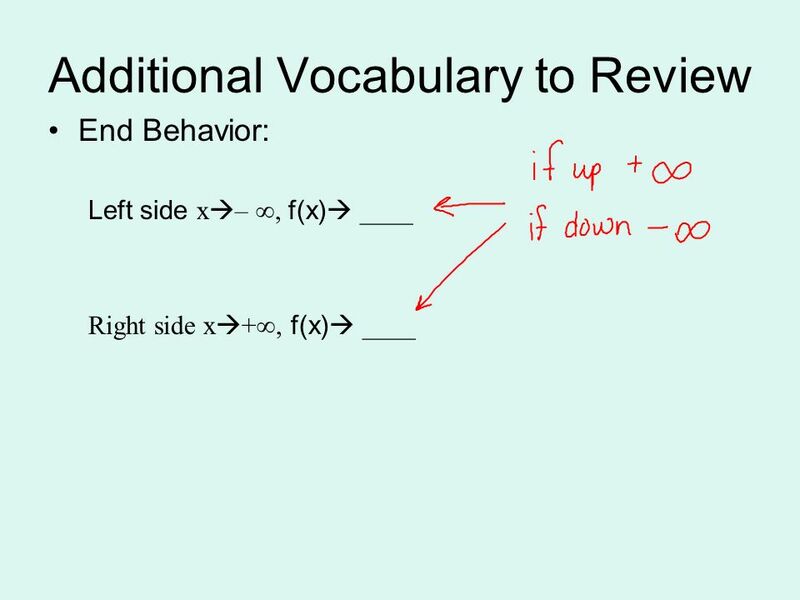 Objectives Calculate and simplify the difference quotient for a given function. Calculate a function value. 6.1 Solving Quadratic Equations by Graphing Need Graph Paper!!! Friday February 7, Properties of Exponent Objective: To evaluate or simplify expression with powers EQ: Can you multiply and divide negative fraction. Sections 3.3 – 3.6 Functions : Major types, Graphing, Transformations, Mathematical Models. 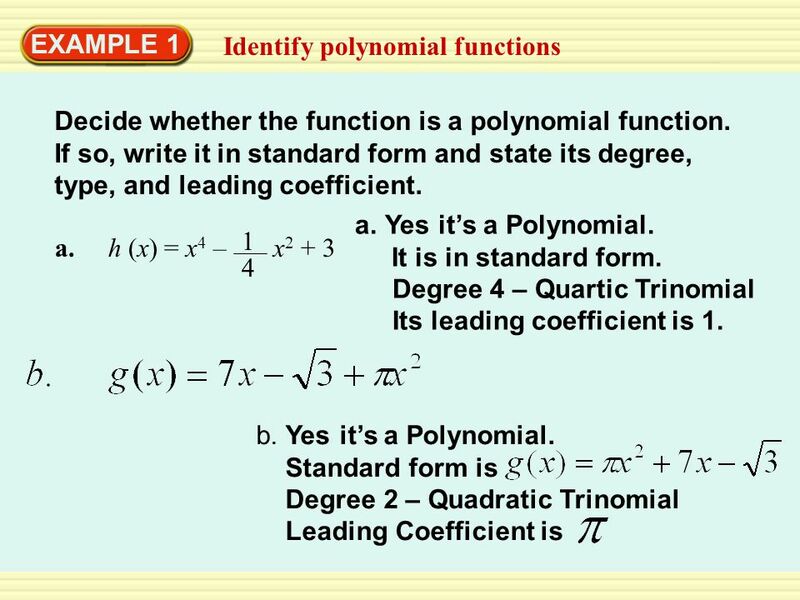 3.2 Properties of Functions. 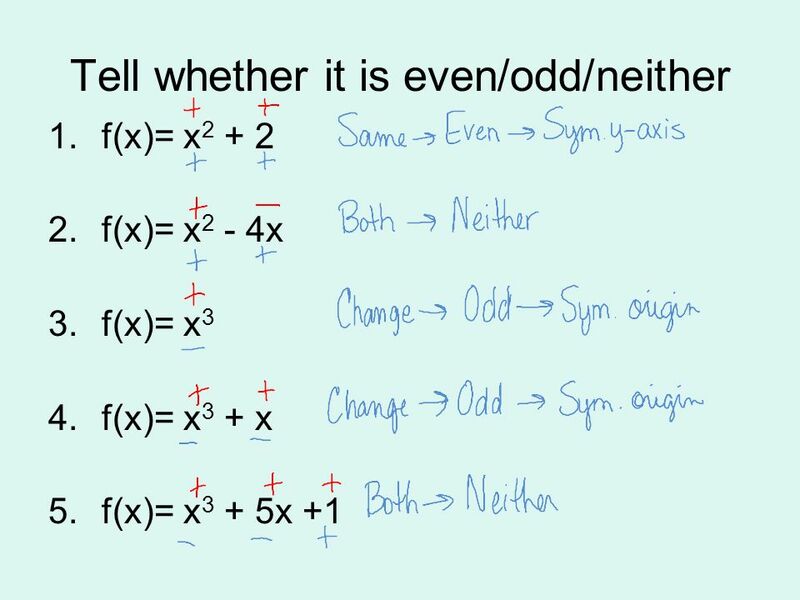 If c is in the domain of a function y=f(x), the average rate of change of f from c to x is defined as This expression is.